If there is one discipline of the ancient days that resembled today’s Mixed Martial Arts (MMA), it was the Greek discipline of pankration. 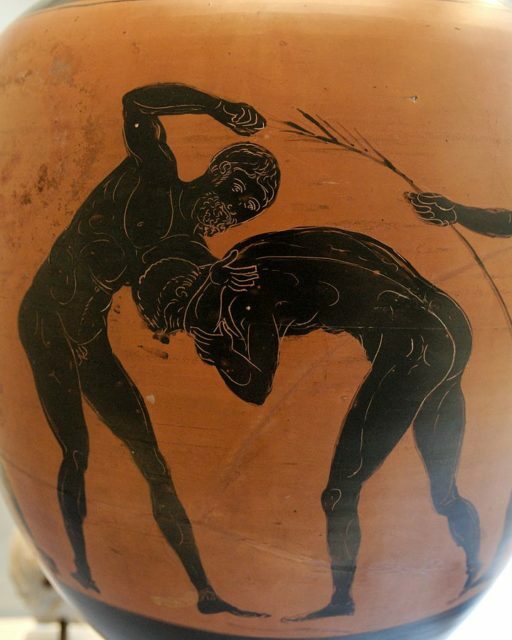 As an ancient combat sports discipline, pankration was introduced into the Greek Olympic Games in 684 BC, and the games scarcely knew any of the rules. 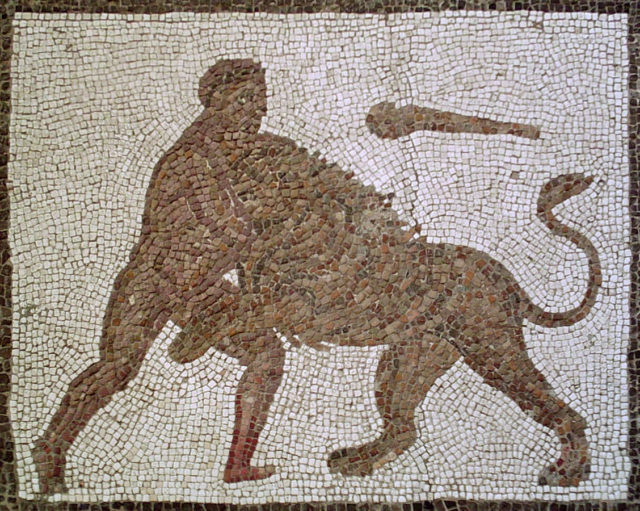 According to Greek mythology, it was Heracles and Theseus, two of the most prominent Ancient Greek heroes who invented pankration as a result of their wrestling and boxing techniques used in fights with opponents. It was believed that thanks to his extraordinary skills, Theseus managed to defeat the notorious Minotaur in the Labyrinth. A number of resources agree that pankration was developed as a combat discipline in the ancient Greek society of the seventh century B.C. Its emergence followed as the interest in violent expressions in sports increased. Pankration filled in a particular niche of “total contest,” something that boxing and wrestling failed to do. Other evidence also suggests that the discipline may have been practiced in Greece even much earlier, throughout the 2 millennium B.C. 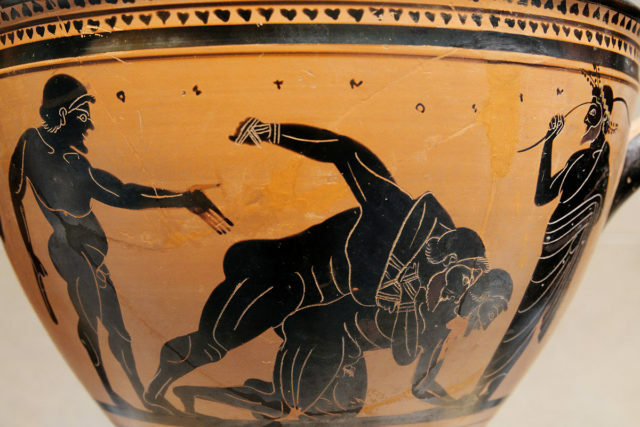 As an athletic event, pankration used both boxing and wrestling techniques, but what struck a chord were its additional elements. The discipline allowed strikes with the legs and there was also evidence of knockouts. Most often, the winner was decided on the ground where both striking and submission techniques would freely manifest in the game. All of it made the fighting sport very similar to today’s MMA encounters. In nature, pankratiasts were very skilled grapplers. They were able to demonstrate a variety of take-downs, joint locks or chokes. In rare cases, the encounters resulted in the death of one of the opponents. 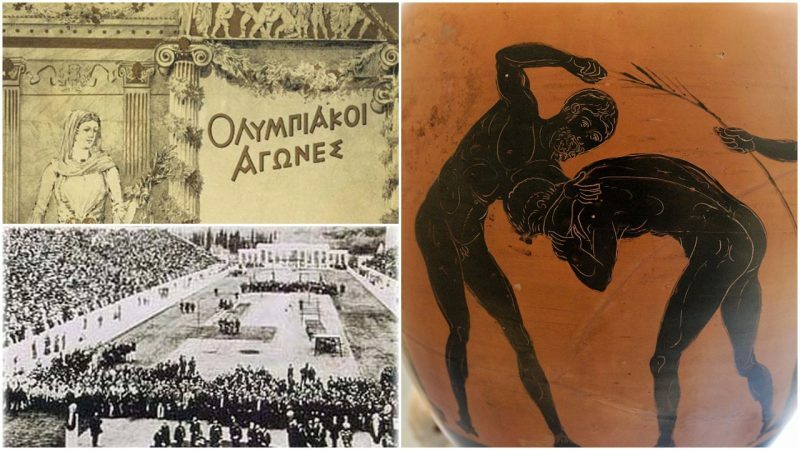 There were two known categories according to age groups in the ancient Olympic games: the first was for adult men and the second for boys. 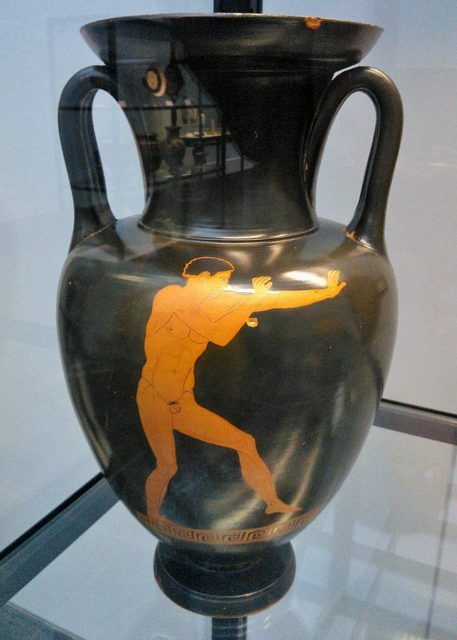 The pankration event for boys was one of later prominence as it was introduced only at the Olympic Games in 200 B.C. As already mentioned, the events allowed anything, except eye gouging or biting. The combat game would last until one of the combatants submitted, which was signaled by the submitting contestant raising the index finger. Under certain conditions, judges would use the right to interrupt the combat and declare a winner or call the game a tie. The combat discipline was embedded as part of Greek society. 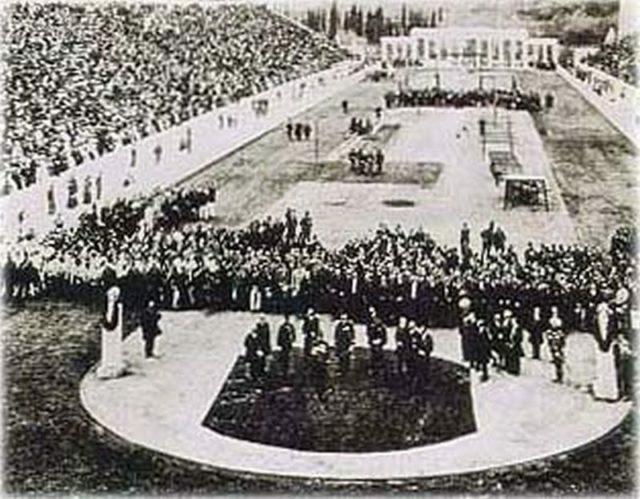 It was not only part of the Olympic games, but also something that Greek soldiers were able to demonstrate, like in the case of the famous Spartan hoplites or Alexander the Great’s phalanx. It is said that the Spartans at their memorable stand at Thermopylae, fought with their bare hands and teeth once their weapons diminished. The second-century author and rhetorician Polyaenus also depicts King Philip, the father of Alexander the Great, practicing with another pankratiast while his soldiers observed the round. But it was the Olympics that allowed Pankratiasts eternal glory in the Hellenic world. The winners of the games were proclaimed invincible beings. Dioxippus of Athens was one of the most famous practitioners of the combat sport, having won the Olympics in 336 B.C. He was also serving the Alexander the Great’s army in its expedition to Asia. An interesting anecdote relates to Dioxippus as he was invited for a combat with one of the most skilled soldiers of the army, named Coragus. Both Coragus and Dioxippus fought in armed combat, in front of Alexander and the troops. As Coragus fought with weapons and full armor, Dioxippus used only his pankration skills and defeated Coragus without killing him. Though much admired, Dioxippus was later on convicted of theft, which led him to commit a suicide. 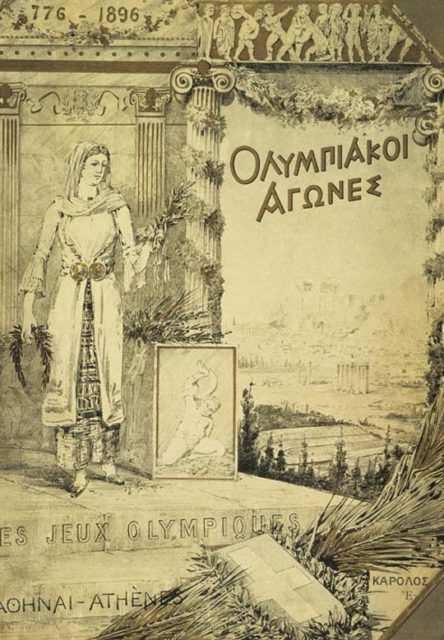 Cover of the official report of 1896 Athens Summer Olympics. Often listed as the poster of the Games. Another intriguing pankration combat relates to the name of Arrhichion of Phigalia who had won the Olympic Games competition despite being dead. As the story goes, the opponent of Arrhichion had him locked in a choke-hold. In a desperate attempt to win, Arrhichion broke his opponent’s toe, which had made the opponent raise the index finger. Once the judge had approached Arrhichion to raise his hand, it was discovered that the choke-hold had a deadly effect. Anyways, Arrhichion’s body was crowned with an olive wreath and returned to his homeland as a hero. After the Greeks, it was the Romans who adopted Pankration, or in Latin, “pancratium.” The discipline was abolished along with gladiatorial combat and a number of other pagan festivities once the Christian Byzantine Emperor Theodosius I had taken the throne. In 1969, the Greek-American combat athlete Jim Arvanitis would introduce the so-called “amateur pankration” to the martial art community. His efforts were considered pioneering in what became mixed martial arts (MMA). The discipline was eventually part of the World Combat Games in 2010. In its modern sense, the UWW acknowledges traditional pankration style that excludes striking on the head and elite pankration style that allows such strikes.